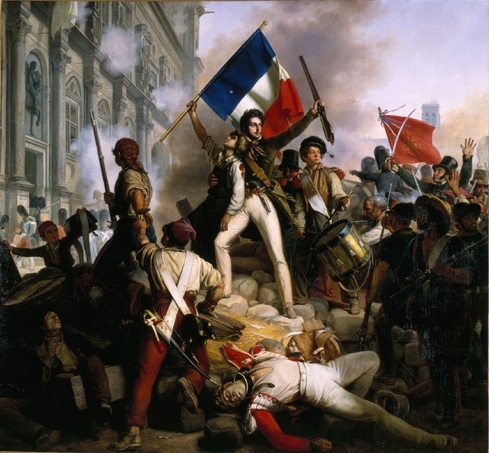 Marc shares some events from this day in history: The beginning of the French Revolution, the birth of guitarist Lady Bo, the arrival of Marcus Garvey in Jamaica, and the day Alabama and Mississippi Democrats walked out of the DNC. 1789 – French Revolution: citizens of Paris storm the Bastille.1790 – French Revolution: citizens of Paris celebrate the unity of the French people and the national reconciliation in the Fête de la Fédération.1791 – The Priestley Riots drive Joseph Priestley, a supporter of the French Revolution, out of Birmingham, England.1798 – The Sedition Act becomes law in the United States making it a federal crime to write, publish, or utter false or malicious statements about the United States government. 881 – Billy the Kid is shot and killed by Pat Garrett outside Fort Sumner. 1928 – New Vietnam Revolutionary Party is founded in Huế amid providing some of the communist party’s most important leaders in its early years.1933 – Gleichschaltung: in Germany, all political parties are outlawed except the Nazi Party.1933 – The Nazi eugenics begins with the proclamation of the Law for the Prevention of Hereditarily Diseased Offspring that calls for the compulsory sterilization of any citizen who suffers from alleged genetic disorders. 1948 – Alabama and Mississippi Democrats bolted the Democratic convention after adoption of a “strong” civil rights plank. 1948 – Palmiro Togliatti, leader of the Italian Communist Party, is shot and wounded near the Italian Parliament.1957 – Rawya Ateya takes her seat in the National Assembly of Egypt, thereby becoming the first female parliamentarian in the Arab world.1958 – Iraqi Revolution: in Iraq the monarchy is overthrown by popular forces led by Abdul Karim Kassem, who becomes the nation’s new leader. 1960 – Jane Goodall arrives at the Gombe Stream Reserve in present-day Tanzania to begin her famous study of chimpanzees in the wild.1969 – The United States $500, $1,000, $5,000 and $10,000 bills are officially withdrawn from circulation. 1976 – Capital punishment is abolished in Canada. 2003 – In an effort to discredit U.S. Ambassador Joseph C. Wilson, who had written an article critical of the 2003 invasion of Iraq, Washington Post columnist Robert Novak reveals that Wilson’s wife Valerie Plame is a CIA “operative”. 1940 – Lady Bo, who played with Bo Diddley and was the first female guitarist in history to be hired by a major rock & roll musician, is born Peggy Jones in New York, NY, USA.